There are so many beautiful dies to choose but the Spellbinders Crisscross is one that you may want to consider. 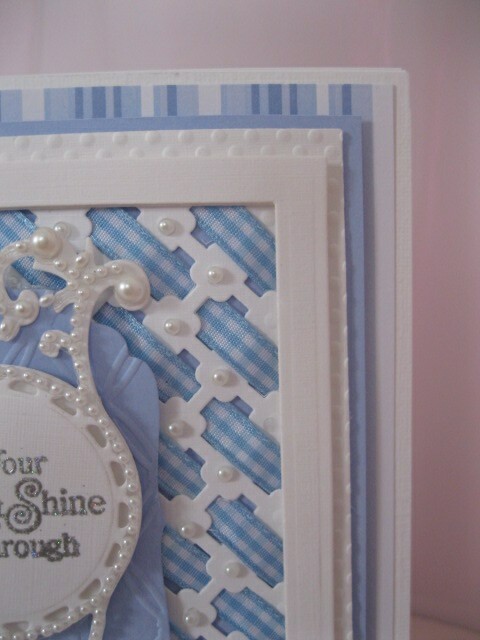 It produces a lovely pattern in your card and there are so many ways to use it. Varying the color of your card will give you a different look each time and try some of the more unusual color schemes and be adventurous. But here I have cut the pattern in white and then threaded it with some pale blue Gingham Ribbon and the effect is really pretty. The video will show you another innovative way in which to use the die and again don't be afraid to mix the colours for another look. If you don't like the look you can always remove the ribbon and start again with something else. But make sure that you have enough ribbon to complete the project as the last thing you want to do is run out of it part way through the project. Adding the adhesive tape to the wrong side simply holds the ribbon in place for you. The finished card would be suitable for any occasion. Just add the sentiment that fits and decorate the front with any embellishments that you have in your "Stash"
So I hope you will give this and some of the other ideas a try and have some fun with your card making as you do.